I explained that inhaling N2O gives me a chance to experience the dulling of the senses, to practice consciously the letting go that will be required of all of us as we die. I smiled at him serenely through a nitrous fog – at least I think I did, just before I opened wide at his command and received the injection. Last week I tried a different way to practice dying. I know from experience that active imagining can be a powerful exercise. Since I live on Puget Sound, and I needed to take a ferry ride that lasts over an hour, I decided to visualize the entire ride as an experience of dying. 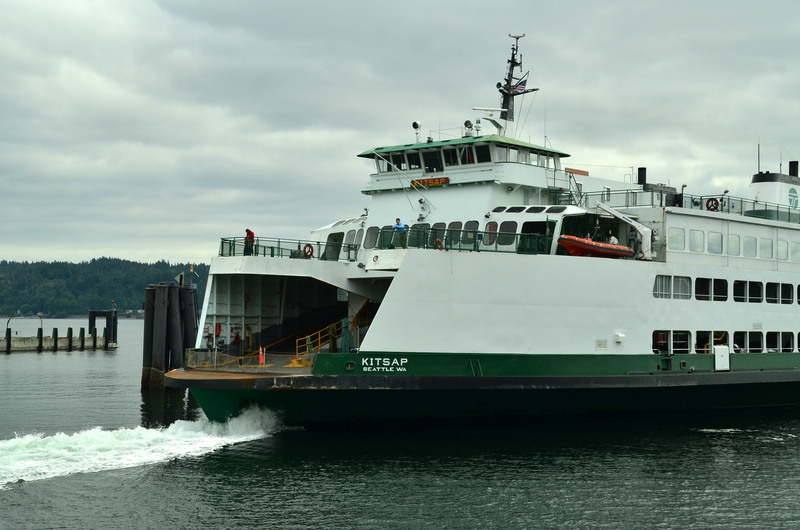 Rather than going up to the passenger lounge, I stayed in my car; I imagined myself gradually slipping away from life the way a ferry slips away from the dock and out onto the Salish Sea. I feel the engines power up and pull us forward. White caps slap and splash against the sides of the ferry, making it rock. I don’t recognize where I am – all islands look alike to me. At first I had to keep settling back into the imagining every time the visuals distracted me. Yet I wanted the visuals to be integrated into the imagining. I won’t be able to control my deathing, so I didn’t want to try controlling this experiment. Ah, the other cars and drivers have vanished from my awareness now. There are just me and the ferry and the passage. I wondered: If I am “dying,” what is the medium on which I float? It bears me, waves of it splash against the shores of distant islands. What is the element that allows not-quite-living/not-yet-ceased-living to be carried from one shore to another? Gray light bounces off the waves, creating irregular shimmers to play against the white surfaces of the vessel. I think of my mother who, when I was little, would position her cup of tea in a patch of sunlight on the round oak kitchen table; she’d subtly jostle the porcelain so that “pixies” of reflected light would dance on the kitchen walls. It is a pleasant memory, a forgiving memory. A part of my deathing journey. I see another ferry passing in the opposite direction. “Have a nice life,” I think, and I’m surprised by how deeply I’m inhabiting this imagining. Imagination is different from fantasy – fantasy is manipulated, while active imagining, if one allows it, unfolds with a will of its own. I’ve lost track of where I left from and where I’m going. I sink into near-sleep – can you fall asleep inside a dying? I see channel markers, rocking buoys with gulls and cormorants flying in, balancing, flying off again. Tiny shoreless green islands. Icy sage green water. Engines slow – I feel a twinge of apprehension – what does this mean? Is the journey over so soon? “No, just discharging some passengers at a smaller island, not your destination.” Wind whips the island tree branches fretfully. Orange windsock on the dock points in the direction I have yet to go. This is not my stop. “Stay on the journey – you’ll know when you arrive.” A crewman signals up to the captain, engines in reverse pull the ferry back into open water. It holds still a moment, the engines reverse again. Who knew that a deathing boat could move in both directions? And yet I’ve seen it, at a bedside, a dying person seems to be at their final moment, then revives and stays around another day or two. Or a baby, in its birthing, is so close to crowning, and then slips back in, uncertain how it feels about abandoning its nine-month home. In a curious mix of calm and concern now, I feel as if my imagining and my reality are one. I let go of the possibility of returning. Then, through unfocused eyes, I’m aware of a gradual change of direction into a leeside harbor. . . calm sheltered waters . . . a ferry berth just the right size to hold its new arrival. I startled as the MV Kitsap’s speaker system informed me of the end of the line. I coughed. My mouth was dry. Drivers returned to their cars, cars returned into focus. 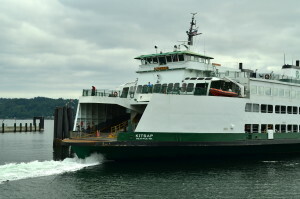 I took a deep breath and when the crewman signaled me, I started my car’s ignition and drove off the ferry. I’m grateful for what I learned last week about deathing. And I’m grateful I got to return to another day of living. Yes, yes, yea about NO2. I’ve often wished for a backpack canister for use in meditating. Once during a long dental procedure, I discovered the meaning of life and the answers to all things. Unfortunately, I couldn’t remember the questions when the NO2 was off.. The metaphor you bring to life is elegant. It’s exquisite in its simplicity. I was startled by the use (maybe invention?) of the term “deathing”….but then why not? Its opposite, “birthing,” is so useful in all kinds of conversations and meditations, a handy term and well-understood. How wonderful if we could move collectively to an equal ease with “deathing….” how we do it, how we support each other, how we are comfortable with it because we have named it. You named it. Actually, it’s not original with me. I first came across “deathing” as a noun some 25 years ago in a book by that title written by Anya Foos-Graber. That book helped me immensely as I attended my husband’s deathing. I have had the opportunity to be shown at least part of my method of transition from this life to the next. Prior to my being medically diagnosed with terminal cancer, when I was in a meditative state I saw my spirit/soul/(insert whatever works for you) slide from my body into an amorphous grey “ferry” that proceeded to take me away. Where “away” was was not revealed to me but, I did feel warm, welcomed and safe. I am solid and very OK with this message or lesson and continue to hold it as what at least part of my experience will be. Thank you for being able to translate your imagination to us in such clear, vivid images Cynthia. I share your desire for nitrous at the dentist’s or even (especially?) at Rite-Aid. Practicing dying is something I’m not quite ready to do, although it does beat the alternative on some ferry rides. Always a pleasure to peek into your mind. Wow is right, Cynthia, my first reaction as well. Thanks for opening up that pathway of the imagination for all of us. She has a room with a view of salt water, distant mountains, and a small inter-island ferry. I am going to print part of this for her and read it to her next time I visit–see if she can hold the metaphor somewhere inside herself. Thank you for your insights, as always. That’s a little too much reality for the joy of N.O. but I can appreciate the gist of it. 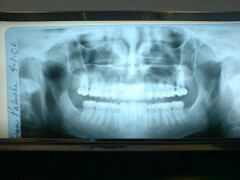 Guess I will have to wait and see where my mind goes the next time I go to see Dr. Julie for dental work!